To support family privacy the system provides for the exclusion of data from both the print and online directory. These options can be managed by the parent when they enter or confirm their data. They can also be updated by your as the administrator by going to the family search, edit the family and click on the Display Options tab. 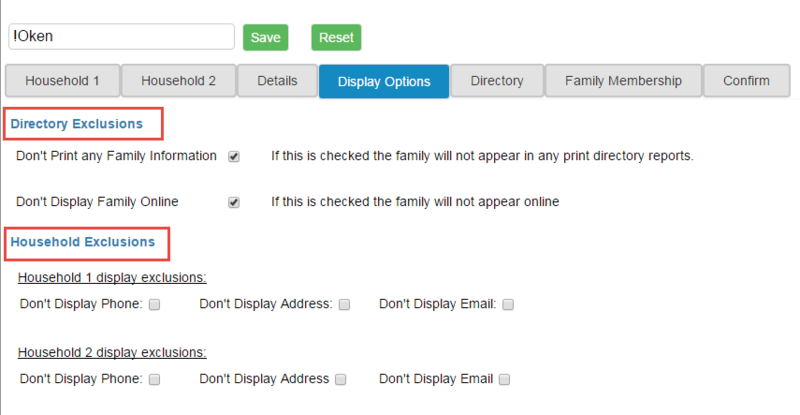 If the family has NOT opted out of the directory using the Directory Exclusions (above) they can opt out of displaying specific items for each household. These include phone, address and email. In the example below the family will not appear in either the printed or the online directory.